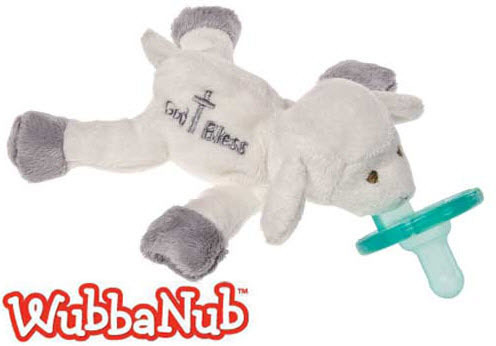 Fall in love with our WubbaNub™ 'God Bless' Lamb. Soft and cuddly, it's unique style allows pacifier to remain close and will easily position to baby. Distributed in hospitals, NICU and well-baby units nationwide. Made wth a Soothie™ medical grade, latex free pacifier. BPA, PVC and Phthalate Free. The durable one-piece construction means no germs hiding between cracks so the pacifier stays cleaner. WubbaNub™ functions as one! Patented design prevents pacifier from being lost, dropped or even forgotten! Carefully calculated weight and size of plush animal keeps the WubbaNub™ near baby's mouth, whether lying on side or back, the car seat, sling or stroller. Plush animal makes it easy for baby to grasp and manipulate the pacifier. Easy to clean: place in washing machine with baby's laundry, gentle cycle in mesh laundry bag. Allow to air dry.